Family property since four generations, Château Pont Les Moines is located at the north of Bordeaux, in the area of Blayais, and extends on the commune of Civrac de Blaye. Vineyard of a surface of 29 ha, on ground argilo-limestone, where the vines have an average age 15 years. Traditional planted grape varieties of this area (70% Merlot, 30% Cabernet-Sauvignon), which produces coloured wines, robust and rounds in mouth. The wine making is traditional, with long fermentings and a maturing out of tanks during 14 month. One gives really pleasure with Blaye Côtes de Bordeaux rouge 2009, full, scented, with these notes of undergrowth, violet and currant, with firm and round tannins at the same time, melted in mouth, of very tannic good base. Beautiful 2008, which at the same time has a powerful and subtle nose, with the ripe fruit notes (blackcurrant, morello cherry), a wine which hardly starts to be melted and deserves a rich kitchen. 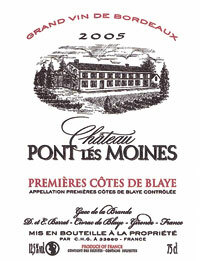 The 2007 are a success, of intense robe, with the nose persistent, fullbodied and dense, very well-balanced in mouth. 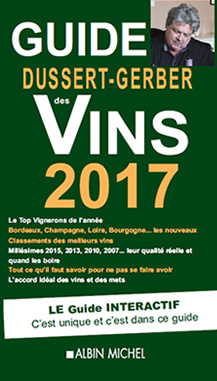 The 2006, of intense color, with the black fruit nose (blackcurrant, blackberry), with very well-balanced tannins, are a wine which continues its evolution. Very nice Bordeaux blanc Sauvignon 2011, floral, quite dry as it should be, all in distinction. Also discover the wines of their other property, Château Bran de Compostelle with this superb bordeaux supérieur cuvée Louisa 2009, maturing in oak barrel 12 months, including 1/3 of new barrels, traditional wine making with long fermenting, robust, with the nose of overripe red fruits, powerful and fullbodied mouth, slightly spiced finally, of intense garnet-red robe, all in nuances, ideal on a salmi of wood pigeons.